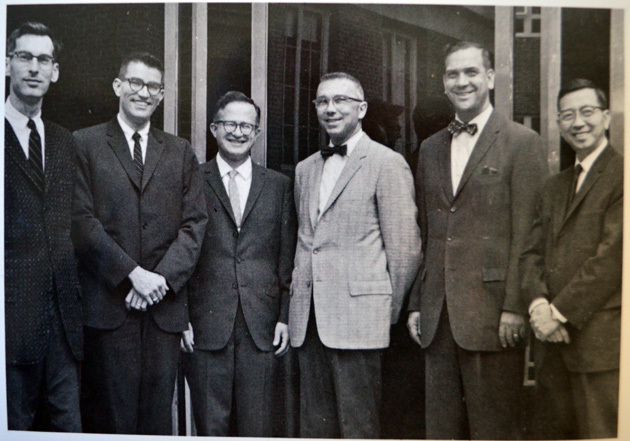 ChemE faculty members in 1962: from left to right, Stanley Middleman, John Bartlett, Richard Kraybill, Shelby Miller, Richard Eisenberg, and Gene Su. Two men helped the Department of Chemical Engineering come of age after World War II. Geoffrey Broughton, a native of England and an MIT PhD graduate, had worked as a chemical engineer for Eastman Kodak Co., served in London with the Office of Scientific Research and Development during World War II, and chaired the paper engineering department at the Lowell Textile Institute before becoming chair of ChemE in 1952. His tenure was tragically brief – he died in 1954 at the age of 42. But within a month of his arrival he proposed a PhD program, and a year later the first three students were admitted. Broughton also laid the groundwork for a strong research program, and for expansion of staff and program. And he initiated extension courses in chemical engineering to benefit employees of local industries. What Broughton began, Shelby Miller (seen at left) brought to fruition as head of the department from 1955 to 1967. 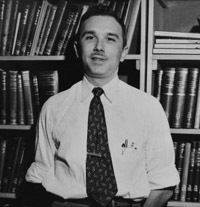 Miller came here from the University of Kansas, where he was a professor and department chair; he also had industrial experience at Du Pont after receiving his PhD at Minnesota in 1940. During Miller’s tenure, faculty size increased from three to 12, and he played a key leadership role as the Department increased its emphasis on graduate education and research, while maintaining its emphasis on undergraduate teaching. A department self-assessment in 1967 noted: "In all this the key concept is engineering -- not science, essential ingredient that it is -- nor engineering science, inseparable organ of engineering that it is -- nor economics, code of law to the engineering industry that it is -- but engineering, the composite of all these and other components."